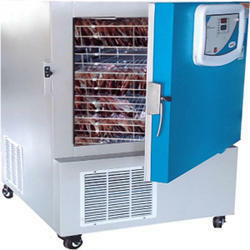 Offering you a complete choice of products which include deep plasma freezer and ultra deep plasma freezers. 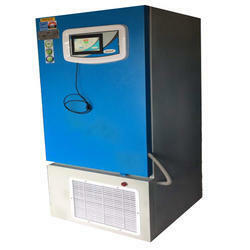 We are engaged in dealing with Deep Plasma Freezer with interior chamber made from stainless steel. Forced air circulation maintains uniformity in the chamber at certain temperature and provides a quick recovery after opening the doors. These freezers are provided with audiovisual alarm that goes on if the temperature deviates from the set temperature. Large 7” touch display with facility to see current and last 24 hours temperature recording, High & Low alarm points with date & time recording, power resumption / failure data. Printing Option : Supports following Dot matrix serial printers: EPSON, SAMSUNG, TVS. Temperature display of set value and process value. The exterior is Sky Blue/white Pure Polyster powder oated (1.0 mm thick) Mild Steel and the door has a magnetic gasket with a keyed lock. 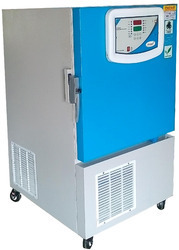 Looking for “Deep Plasma Freezer”?